The first step in carpenter ant control is a thorough inspection in and around the structure. 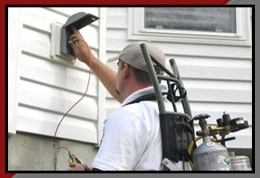 You'll want us to inspect all areas that conducive to carpenter ants from the ground level to the roof. Carpenter ants are most active at night. Sometimes an evening is necessary to locate a difficult carpenter ant problem. Key to eliminating carpenter ants is locating the colony. This often difficult as the carpenter ants usually locate their nest wall or ceiling voids where it is hard to get at.